Aviary Temporary Closure - The Edward Youde Aviary in Hong Kong Park is to close from 17th September 2018 until 1st February 2019 for the first phase of refurbishment works. 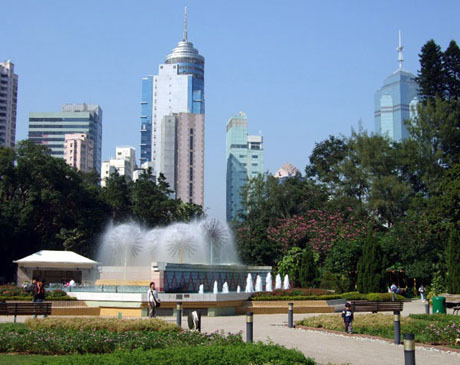 Opened in 1991 Hong Kong Park stands on the site of the British Army’s former Victoria Barracks in the Central District of Hong Kong Island and covers an area of 8 hectares. A number of preserved garrison buildings remain in the park including Flagstaff House (former residence of the Commander-in-Chief of the British Armed Forces) which currently houses the Flagstaff House Museum of Teaware, Rawlinson House, currently housing the Park Management Office and Cotton Tree Drive Marriage Registry, Wavell House, currently accommodating the Education Centre and Cassels Block, currently home to Hong Kong Visual Arts Centre. This attractive park which is dwarfed by the high-rise office blocks of the business district somehow manages to instil a wonderful air of calm and tranquility in the frenetic heart of the city. 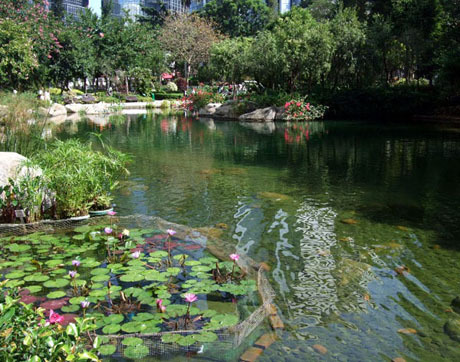 The park has a lake and waterfall, conservatory, large walk-through aviary, viewing tower, tai chi garden, SARS memorial garden, fountains, “Olympic Square” amphitheatre, clock tower, childrens playground, restaurant and snack kiosks. The Edward Youde Aviary (closed for refurbishment works from 17th September 2018 until 1st February 2019) which houses some 600 birds of 90 species from the Malesian rain forests is built over a “valley” with rich vegetation and a stream. 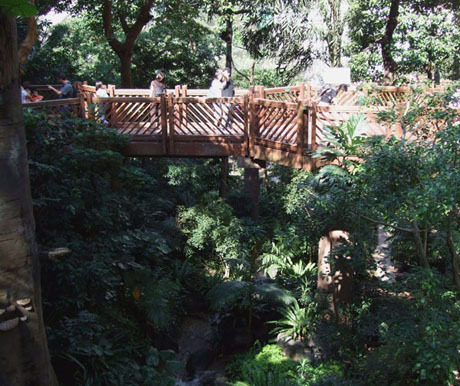 An elevated walkway in the aviary allows visitors to walk through the tree canopy and view the birds, trees and plants from different elevations and angles. The Central Garden located near the Supreme Court Road entrance has a gateway supported by decorative columns and a tree-lined promenade leading to a circular fountain in which visitors can sit surrounded by a sheet of water. 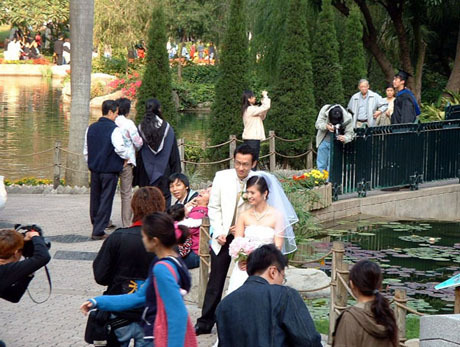 The park is also home to Cotton Tree Drive Marriage Registry and provides a scenic backdrop for newly-wed couples to pose for photographs. 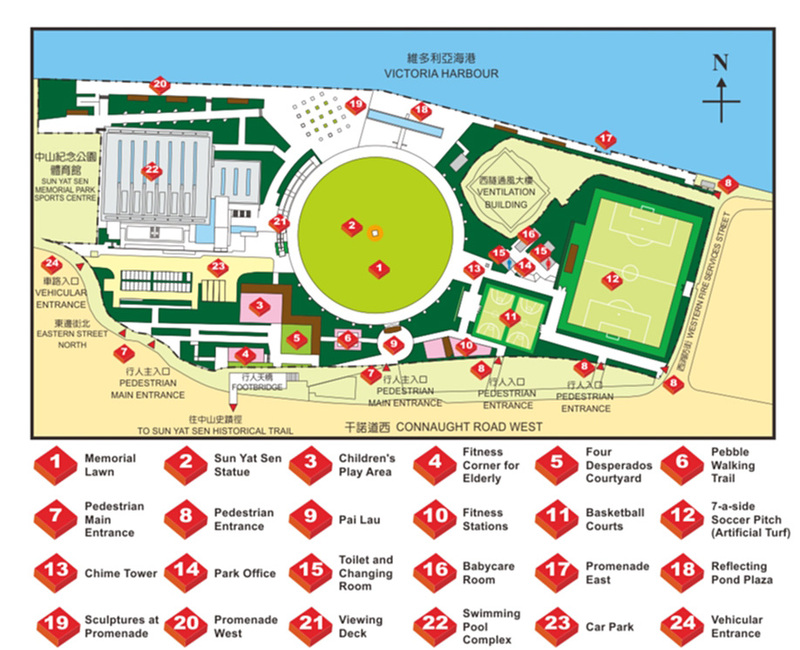 Hong Kong Sports Centre and Hong Kong Squash Centre are located in the north-west corner of the park near the Lower Peak Tram Terminus whilst the Flagstaff House Museum of Teaware is situated in the north-east corner. From noon until 6pm on Saturdays, Sundays and public holidays an "Arts Corner" operates in an outdoor area near the Flagstaff House Museum of Tea Ware with handicraft and arts service stalls selling selling pottery, straw-weaving works, dough models, paper craftworks, carving works, accessories, floral artworks, sand paintings, cloth artworks and clay works, and offering services of photography, painting, calligraphy, silhouette cutting and sketching/caricature. 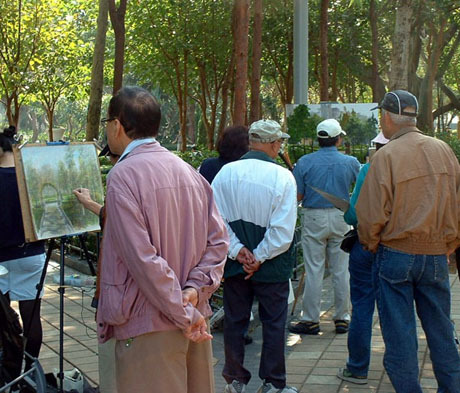 Larger arts fun fairs also operate in Victoria Park and Kowloon Park. GETTING THERE – MTR Admiralty Station exit C1. Take the covered footbridge across Queensway, enter Pacific Place Shopping Mall and take the escalators on the right to the very top then cross Supreme Court Road into Hong Kong Park. OPENING HOURS – 6am to 11pm daily. Aviary and Conservatory open 9am to 5pm daily (free admission). See Flagstaff House Museum of Teaware for museum opening times. 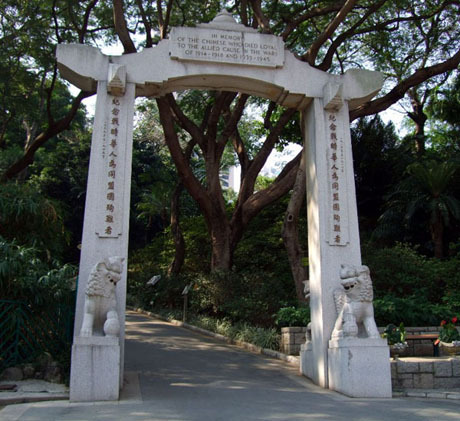 The Hong Kong Zoological and Botanical Gardens (HKZBG) are located on the northern slopes of Victoria Peak about ten minutes uphill walk from Hong Kong Park and occupies an area of 5.6 hectares. The gardens were opened in 1864 as a Botanic Garden but have since been substantially extended and subsequently renamed to reflect the increased emphasis on zoological exhibits. The excellently maintained gardens are divided into two parts on either side of Albany Road and linked by subway. Features of the gardens include a large aviary, bamboo garden, camellia garden, herb garden, magnolia garden, palm garden, bauhinia garden, azalea garden, fountain terrace, greenhouse, pavilion, memorial arch, mammal enclosure, reptile enclosure, pavilions, education and exhibition centre, children’s playground and refreshment kiosk. About half the site is dedicated to zoological exhibits with about 70 reptiles, 70 mammals and 500 birds housed in 40 enclosures. 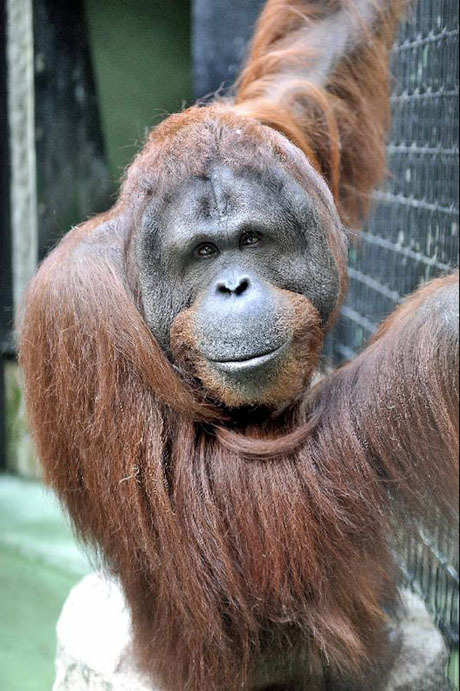 Mammals include orang-utans, gibbons, porcupines, tamarins, macaques, lemurs, agouti and marmosets. Reptiles include Burmese Python, terrapins, tortoise, alligators and turtles and birds include flamingos, mynahs, geese, ducks and cranes. 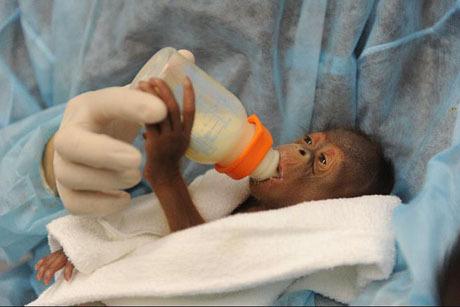 One of the twin baby orangutans, Wan Wan (male) and Wah Wah (female) born at HKZBG, being hand fed after initially being rejected by its mother. The twins were first put on display to the public through a viewing window in February 2012 in two one-hourly daily sessions. 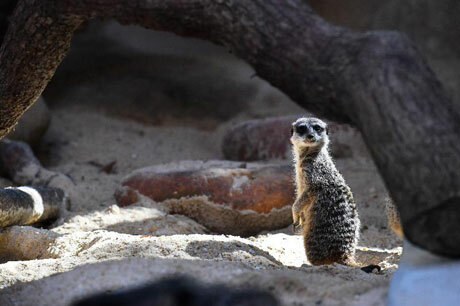 In December 2016 two female meerkats age 4 and 5 were introduced into the gardens and are housed in "Meerkat's Home"
One of the two female meerkats in "Meerkat's Home"
There are over 1000 species of plants including conifers, figs, palms, gum trees, roses, orchid trees, cypress and pines. At the southern entrance to the gardens is a memorial arch dedicated to the Chinese who died assisting the allies during the two World Wars. The spectacular triple-fountain is surrounded by colourful gardens and benches and is a wonderful place to sit and relax. 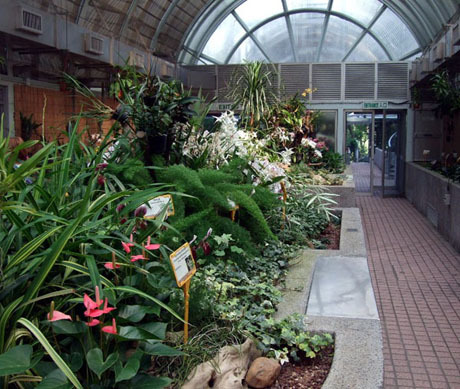 Visitors can also walk through the greenhouse on the Garden Road side of the gardens where there are thematic displays including orchids, climbers, scented plants and ferns. The education and exhibition centre displays stuffed sea turtle, pangolin, crocodile and lepidoptera and skins of different animals including the python, cheetah and leopard. The female jaguar Siu Fa who was resident in the park for 20 years died of old age in 2008 and a taxidermy specimen of Siu Fa is on exhibition in the centre. There is also information about tree propagation and butterflies commonly seen in Hong Kong. The compound previously occupied by Siu Fa has been renovated and is now occupied by ruffed lemurs. OPENING HOURS – 6am to 7pm daily. Fountain Terrace Garden open 6am to 10pm daily. Greenhouse open 9am to 4-30pm daily. Education and Exhibition Centre open from 9am to 4-30pm daily. GETTING THERE – The gardens are about 10 minutes walk uphill along Garden Road from Hong Kong Park (Cotton Tree Drive exit near Lower Peak Tram Terminus). The route from Hong Kong Park is well signed. By bus – route 12 (from Central Ferry piers), 13 (from City Hall), 12A and 12M (from Admiralty MTR Station). Victoria Park which opened in 1957 is built on reclaimed land on the site of a former typhoon shelter and covers an area of 19 hectares making it the largest park on Hong Kong Island. A large statue of Queen Victoria after whom the park is named is located at the main entrance to the park on Causeway Road. 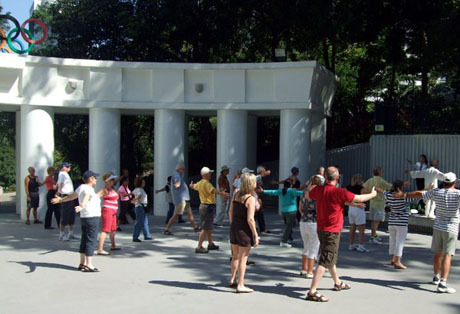 This is a very popular park open 24 hours a day and it is not uncommon to see people exercising and practising tai chi during the middle of the night. The park has attractive tree-lined avenues, central lawn, jogging and fitness trail, fountains, bandstand, pavilions, pebble walking foot massage trail, model boating lake, landscaped themed gardens, over 500 trees, roller skating rink, swimming pool, squash courts, bowling green and children’s play areas. Redevelopment of the current swimming pool complex commenced in August 2009 and is expected to be completed by the end of 2012. Upon the completion of the new pool complex, the existing one will be demolished, after which a roller skating rink, a handball court and landscaped areas will be constructed in the area. Several all-weather football pitches and basketball courts line the southern boundary of the park alongside Causeway Road. There are several tennis courts and 3600-seat “Centre Court” stadium which is the venue for an annual international womens tennis tournament attracting leading players and past winners have included Venus Williams, Kim Clijsters, Monica Seles and Jennifer Capriati. At the Gloucester Road entrance is a giant video screen overlooking a fountain pool and piazza. 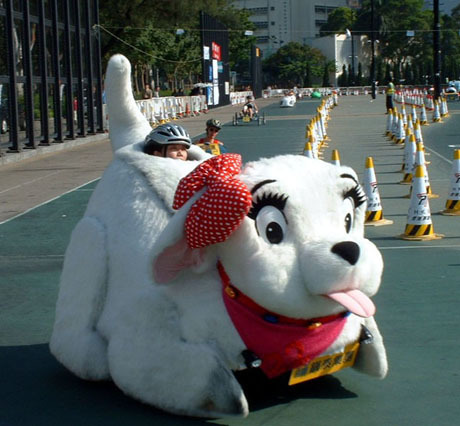 The park is the venue for several major exhibitions including Hong Kong Flower Show, Hong Kong Brands and Products Expo and Lunar New Year Fair and Flower Market and numerous other events including an annual 24 hour pedal-cart race. At weekends particularly on Sundays the park becomes a colourful and vibrant meeting place for Indonesian and Filipino domestic helpers on their day off and there are concerts, a large flea market known as FARM organised by Chinese YMCA of Hong Kong and various other entertainment and religious gatherings. 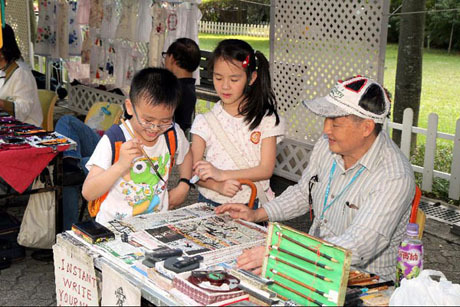 Every Sunday and public holiday an arts fun fair operates at the park's South Pavilion Plaza from 10am until 6pm with about 36 stalls selling handicrafts and artworks including dough models, carving work, accessories, floral artwork, cloth artwork and clay work and offering services such as calligraphy, photography and painting. The north-west corner of the park has a footbridge linking it to Causeway Bay Typhoon Shelter from where there are good harbour views and a short walk along the promenade leads to the Jardine’s Noon Day Gun opposite the Excelsior Hotel. There is a refreshment kiosk near the central lawn and a restaurant within the swimming pool complex overlooking the pool. OPENING HOURS – Park open 24 hours a day. Tennis Courts open 7am to 11pm daily (6am to 11pm April to September). Swimming Pool open 6-30am to 10pm April to October. 6-30am to 12 noon November. Closed December to March. Bowling Green open 7am to 11pm daily. Squash Courts open 7am to 11pm daily. GETTING THERE – Causeway Bay MTR Station exit E is about 5 minutes walk from Gloucester Road park entrance via Great George Street. 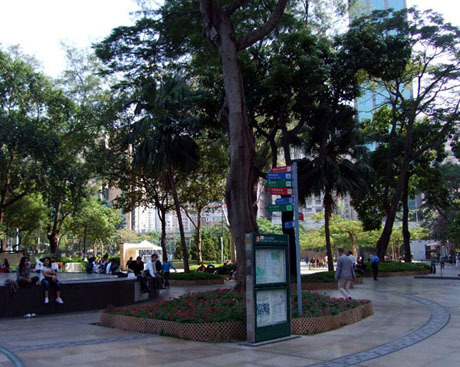 Tin Hau MTR Station exit A2 is about 2 minutes walk from Hing Fat Street park entrance. Trams pass the Causeway Road entrancethe park. Bus routes 2,5,8,10,19,23,25,77,99,102,106,112,116,170,680,690,692,948,968,A11,E11 all pass one or more of the park entrances. Sun Yat Sen Memorial Park, opened in June 2010 in a harbourside location off Connaught Road West at Sai Ying Pun covers an area of about 4.1 hectares and is dedicated to Dr Sun Yat-sen, "the father of modern China". Dr Sun had played a leading role in the 1911 Chinese revolution and had gained many of his revolutionary ideas whilst based in Hong Kong as a medical student. 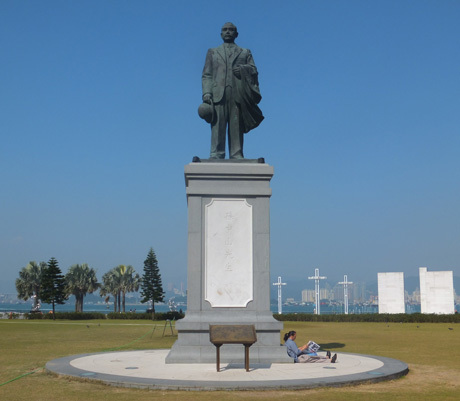 He was forced out of Hong Kong by the British colonial government following pressure by the Qing Dynasty owing to his influence on the revolution and the park, built on reclaimed land, is the location which was the only place where Dr Sun could subsequently meet his supporters on a boat whilst on his way back to the mainland. Dr Sun's life is also celebrated in Hong Kong at the Dr Sun Yat-sen Museum, opened in 2006 in the renovated Kom Tong Hall on Caine Road. The park is dominated by a large statue of Dr Sun in the middle of the circular Memorial Lawn. On the perimeter of the lawn is the Chime Tower which reflects the influence the education which the young Dr Sun received in Hong Kong had on his revolutionary ideals. The roof of the tower is modelled on the design of the Main Building of University of Hong Kong and five bronze bells symbolize the five powers enshrined in the Five-Power Constitution Dr Sun proclaimed in 1921, namely the power of executive, legislative, judicial, examination and control. 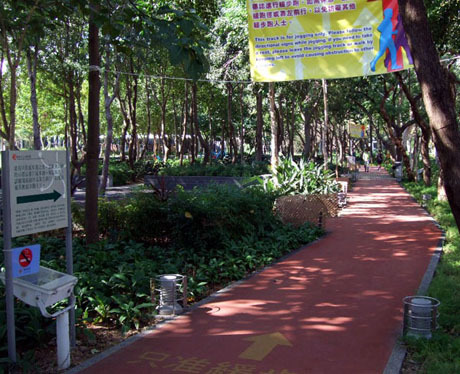 On the southern fringe of the park near the Connaught Road West footbridge is the Four Desperado Courtyard. "The Four Desperadoes" refer to Dr Sun Yat-sen, Chen Shaobai, Yau Lit and Yang Heling. In the final years of Qing Dynasty, the four often met at Yang Yao Ji, a shop (an ancestral property of Yang) at 8 Gough Street, Central.They discussed current affairs of China, plans to overthrow the Manchu regime and the history of Taiping Rebellion. Revolution was considered treason in the conservative society which led to them being referred to as "The Four Desperadoes". When Dr Sun established the Guangzhou Military Government in 1921 (the 10th Year of the Republic of China), he often held meetings with Chen, Yau and Yang at Wenlan House on Guanyin Hill (now known as Yuexiu Hill). He also had the House renovated and renamed it “Four Desperado House” to commemorate their years at Yang Yau Ji. 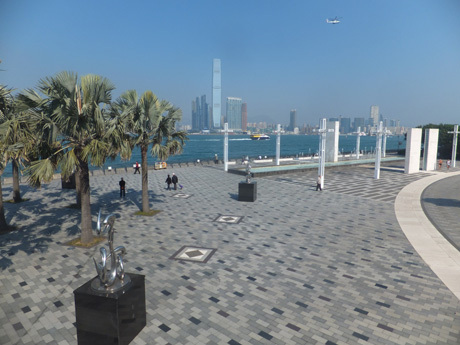 Other features of the park include a waterfront promenade with sculptures and splendid views across the harbour to West Kowloon and plenty of harbour activity with a constant stream of ferries serving Macau Ferry Terminal and Central Piers, children's play area, viewing deck, pebble walking trail, fitness stations, basketball courts, 7-a-side artificial football pitch and sports centre with swimming pool. OPENING HOURS – Park open 24 hours a day except the 7-a-side soccer pitch which is open from 8am to 11pm. Sports Centre swimming pool open 6-30am to 10pm (closes September and October for annual maintenance). Shau Kei Wan/North Point/Western Market - Kennedy Town (Eastern Street Stop), cross Connaught Road West via Eastern Street pedestrian flyover to park entrance.